Word documents (or a equivalent) are very useful when moving home. We have one document on our computer that lists all of the places we'll need to change our address once we've moved (bank, PayPal, doctor, library, school, online photo printing company, Blurb, Amazon, etc). Any time we register with a new website or elsewhere where we need to give our address we note it in the Word document. Then when we eventually come to move we don't have to wrack our brains each time in the hopes of rememebring all of the people to notify. It takes the guesswork out of a tedious process. See the little numbers in the top left corners? I had a Word document with corresponding numbers and next to the numbers I would list in detail everything that was in the box. Then, after moving, if I wanted a particular item - for example sunscreen - I would do a search in the Word document for "sunscreen" and then I could see what number box it was in. I knew exactly which box to unpack for that item. 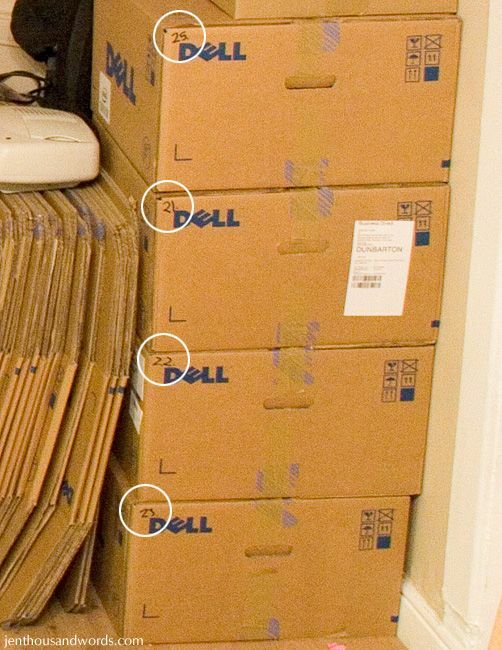 So much easier than physically searching through every box, safer than writing on the boxes what the contents were (why advertise to your movers where your valuables are? ), easy to cross off your list as the boxes are unpacked, easyto not only track progress but also notice if any boxes are missing, and a comprehensive list of everything you've packed. Use in conjunction with the priority system and you can't go wrong!